Thousands of people in the Netherlands say they expect the world to end in 2012, and many say they are taking precautions to prepare for the apocalypse. The Dutch-language de Volkskrant newspaper said it spoke to thousands of believers in the impending end of civilization, and while theories on the supposed catastrophe varied, most tied the 2012 date to the end of the Mayan calendar, Radio Netherlands reported Monday. Continue reading Mayan Myth or Reality? 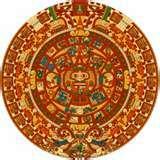 Among their other accomplishments, the ancient Mayas invented a calendar of remarkable accuracy and complexity. At right is the ancient Mayan Pyramid Chichen Itza, Yucatan, Mexico. The Pyramid of Kukulkan at Chichén Itzá, constructed circa 1050 was built during the late Mayan period, when Toltecs from Tula became politically powerful. The pyramid was used as a calendar: four stairways, each with 91 steps and a platform at the top, making a total of 365, equivalent to the number of days in a calendar year.